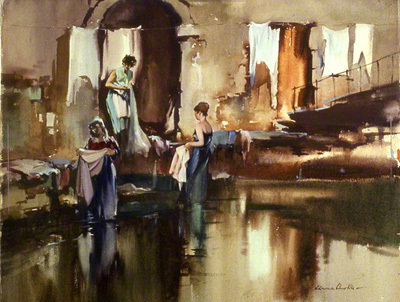 A water colour showing three ladies washing and folding cloths. This is Spanish scene which probably does not take place today. (2012) Claude Buckle often seems to have cloths hanging in the pictures. The figures in this picture are the central theme, there is also a magnificent water reflection in the foreground of the picture and architectural stonework in the background. Created in 1967.